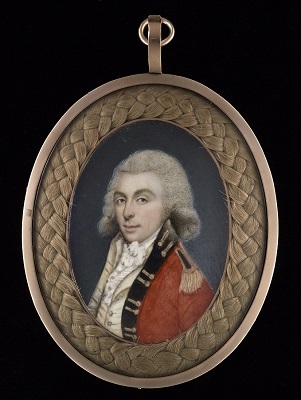 Likewise in Ireland, the demand for portrait miniatures during the mid-eighteenth century was enormous and a brief survey of the leading exponents of the day reveals that a large proportion of them originated from Ireland, and in particular, Dublin. Following the Dublin Society’s takeover of Robert West’s private school of art in 1746, the arts in Ireland began to thrive and the school offered lessons in figurative, ornamental, architectural and landscape drawing free of charge. The society acted in many ways as a ‘feeder’ into the profession of portrait miniature painting and apprenticeships to an established artist normally followed graduation. Some of the most notable Irish portrait miniature painters include; Horace Hone, who mastered the art in both enamel and ivory, Luke Sullivan, who was also a highly skilled painter in oils and Adam Buck whose highly distinctive miniatures and works on paper are now highly collected. Although currently unknown, the artist of the present work was clearly highly accomplished and one can note the clever exploitation of the ivory surface which is seen glowing through the sitter’s shirt.